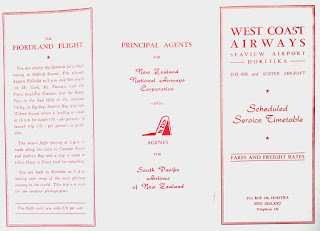 As early as 1952 NAC was looking to transfer its South Westland service to a private operator. At this stage the road was still some years away from Haast and the air service pioneered by Air Travel (NZ) Ltd’s Bert Mercer, along with the shipping service from Hokitika provided Haast with its only connection with the rest of the country. 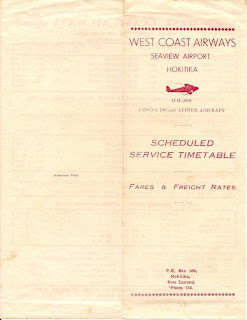 On the 29th of January 1953 the Air Licensing Board were scheduled to sit in Hokitika to consider an application by Southern Scenic Air Services Ltd for “a scheduled passenger and freight service between Hokitika and Haast with stops at Whataroa, Waiho and Weheka.” Southern Scenic, however, withdrew their application. 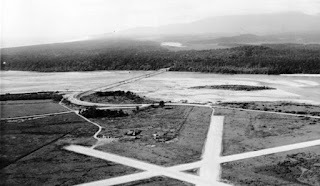 (e) Aerial topdressing and other aerial work on the West Coast of the South Island of New Zealand from Inangahua Junction to Haast. 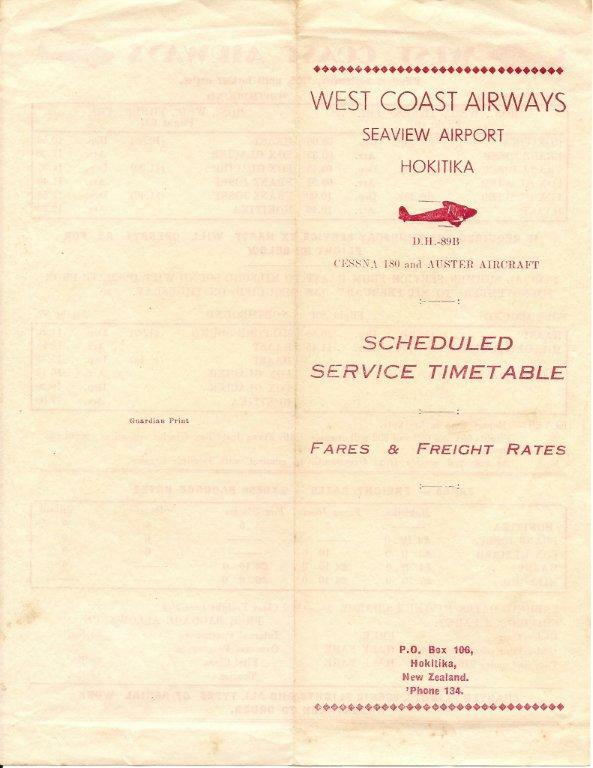 West Coast Airways’ inaugural flight was operated by De Havilland DH89A Dragon Rapide ZK-AHS on a Hokitika-Haast return service on the 19th of November 1956. 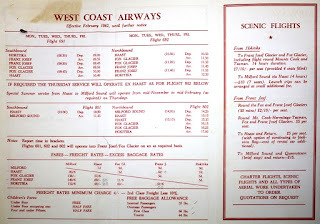 West Coast Airways used a number of Southern Scenic Air Services aircraft, particularly their de Havilland 89 aircraft, but also Cessnas, Proctors and their Anson. Three aircraft carried West Coast Airways’ titles; De Havilland 89A Dragon Rapide ZK-AHS, De Havilland 89B Dominie ZK-AKT and Cessna 180 ZK-BJY. 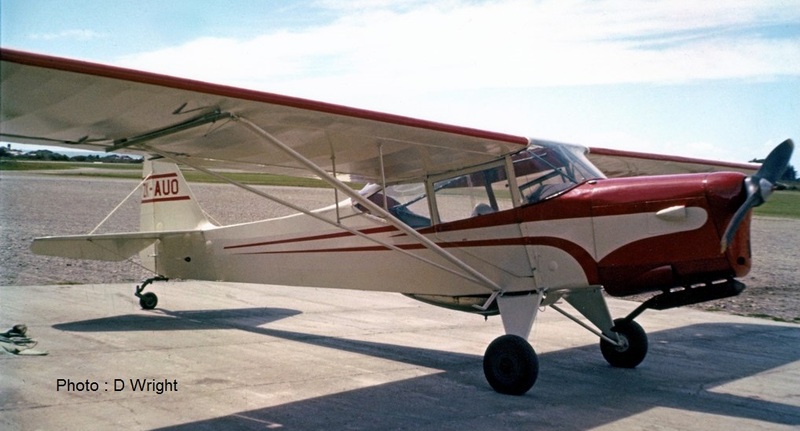 In addition to the air service the company was involved in a variety of activity including scenic flying, supply dropping, air ambulance work and general charter work. 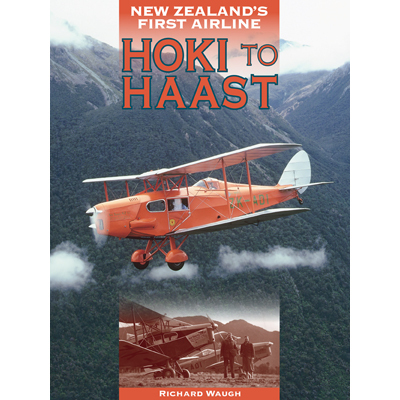 The construction of the Haast Pass meant flights to Haast were the mainstay of the scheduled service, these carrying both passengers and freight to cater for the locals and construction workers alike. 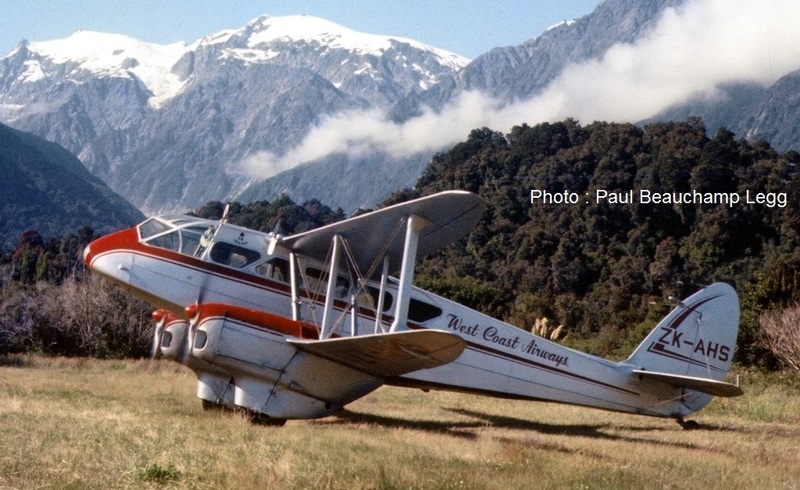 Scheduled flights more aimed at tourists were flown from Hokitika to Franz Josef and Fox Glacier. In addition an on-demand Thursday flight was also offered from Haast to Milford Sound over the summer months from mid-November to mid-February. 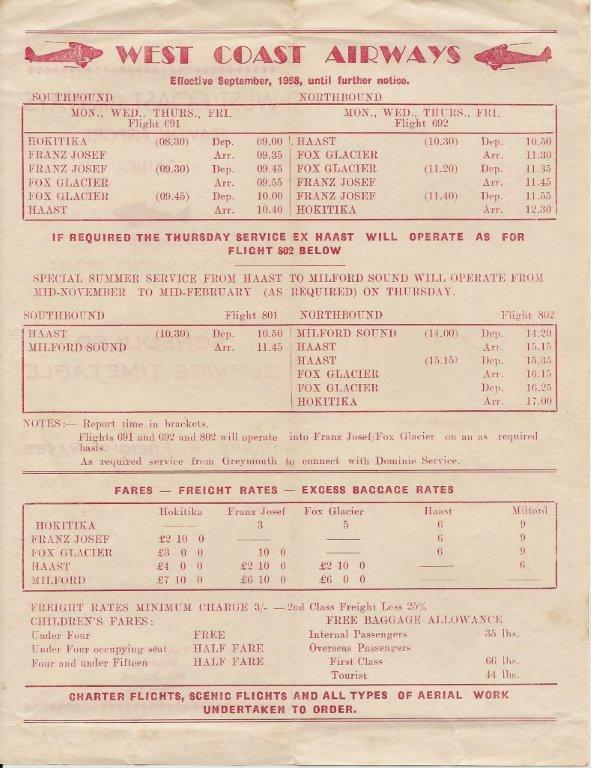 The basic timetable was a weekday service from Hokitika to Haast, leaving at 9.00am and landing at Franz Josef and Fox Glacier as required. The return service arrived back at Hokitika by 12.30pm. 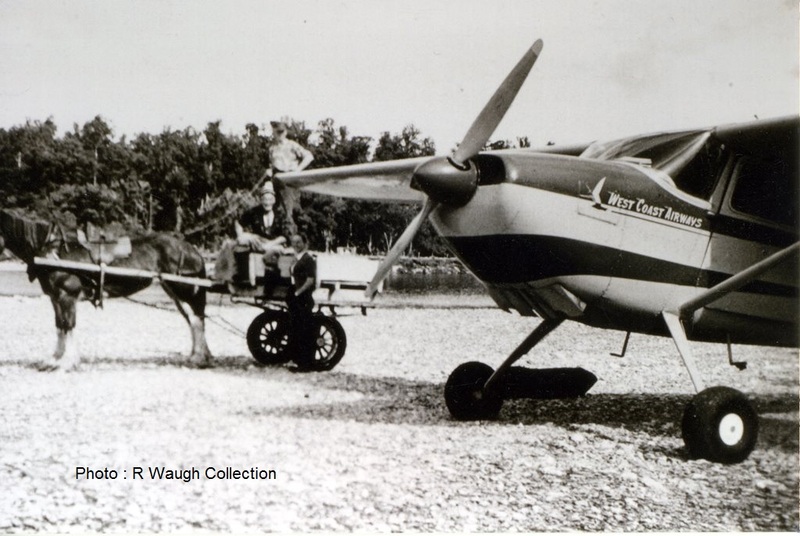 Cessna 180 ZK-BJY at the Paringa River in 1959. West Coast Airways was conscious there were often people from Greymouth who needed to fly to South Westland and so the company applied to operate a non-scheduled service between Greymouth and Hokitika from the 1st of July 1957 using Des Wright’s Auster J/1B Aiglet, ZK-AUO (c/n 1955), as the Greymouth airfield was not licensed to take Dominies. A non-scheduled service was not approved but the company was able to operate an air taxi service between Hokitika and Greymouth to connect to the regular air service. Des Wright's Auster Aiglet ZK-AUO taken at Hokitika in the early 1960s. 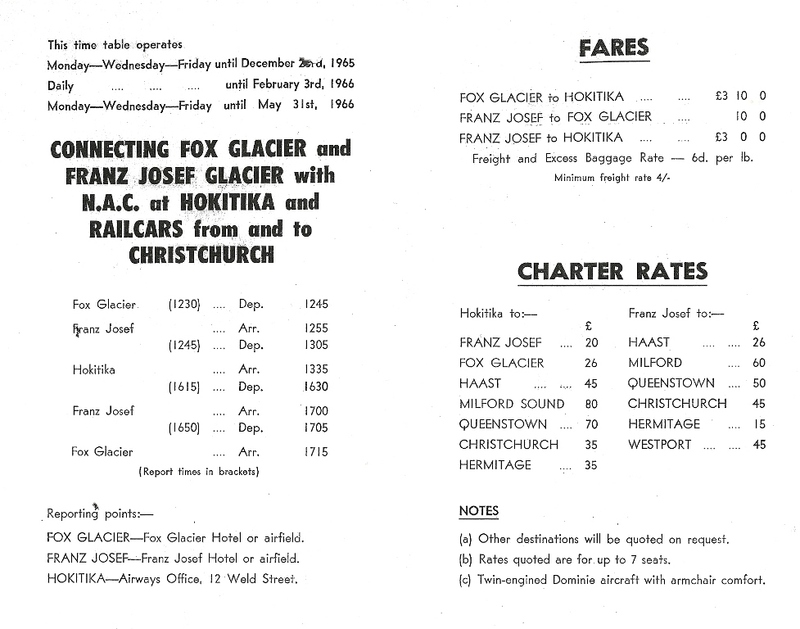 With the opening of the Hasst Pass West Coast Airways amended their air service licence amended by deleting their scheduled Hokitika - Haast service replacing it with a connection between Fox and Franz Josef Glaciers and Hokitika. 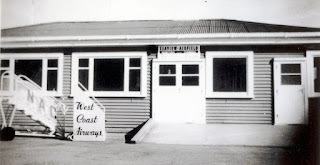 The opening of the road to Haast and the introduction of regular bus services to Haast had eliminated the bulk of the company's scheduled passenger and freight business on the Haast-Hokitika service which formerly, on a non-scheduled basis, had served the Glaciers. In the year ended 31 March 1965 the company carried 1309 scheduled passengers and flew 456 scheduled hours. 1205 passengers were from or to Haast as was all the 43,956 lb. of freight and 36,399 lb. of mail. The Glaciers together generated only 160 passengers. 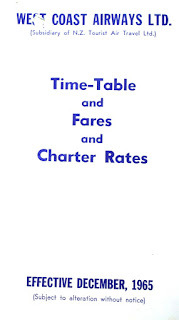 Nonetheless, a service to the Glaciers seemed the best option for the company. 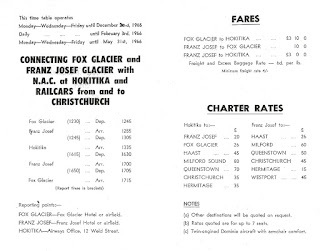 Traffic on the Fox Glacier-Franz Josef-Hokitika route, even with its connection to the NAC DC-3 service to Westport, Nelson and Wellington, was not sufficient to sustain the company. 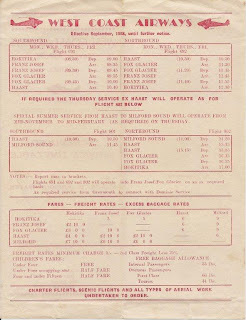 On the 20th of March 1967 the manager of Southern Scenic Air Services, Mr W Davies announced the end of the service with all operations ceasing on the 31st of March 1967. 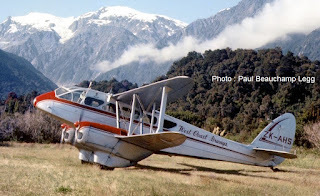 De Havilland 89A Dragon Rapide ZK-AHS first flew out of Hokitika for Cook Strait Airways as ZK-AGT. 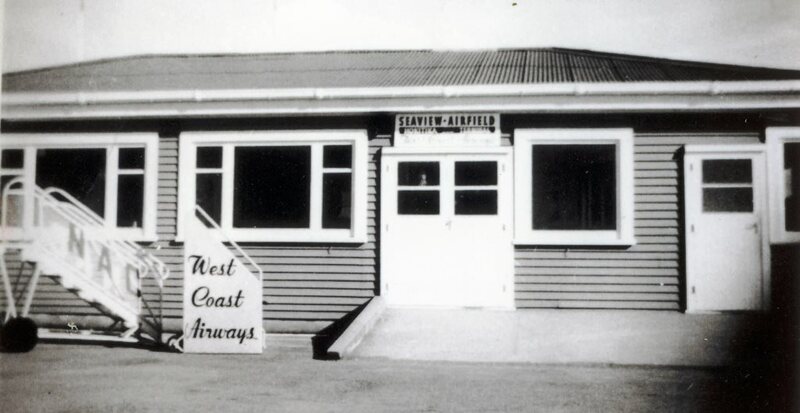 During the latter years of the War it returned to Hokitika as ZK-AHS being operated for Air Travel (NZ) Ltd north to Westport and Nelson. With the formation of NAC it operated the service north to Nelson and to South Westland. 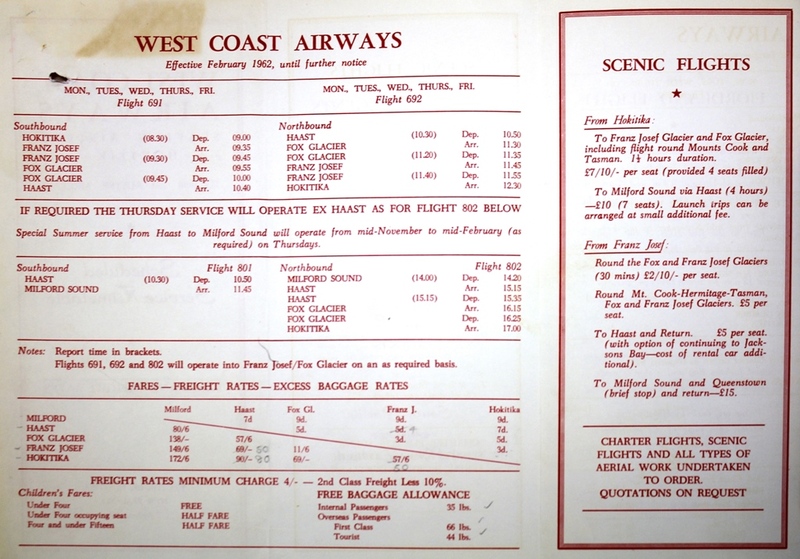 During its time with West Coast Airways it carried West Coast Airways and Southern Scenic titles as seen above at Haast on a West Coast Airways service. 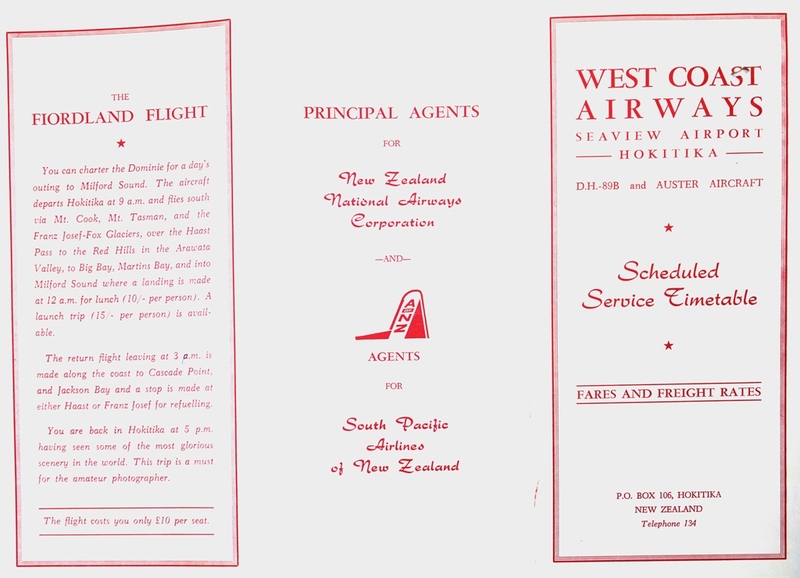 When the air service ended it was transferred to Queenstown and rebranded in NZ Tourist Air Travel titles. 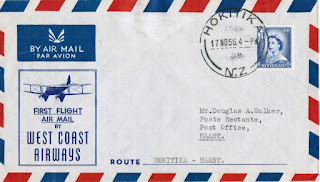 It was for a number of years stored back at Hokitika before being donated to MOTAT in Auckland. 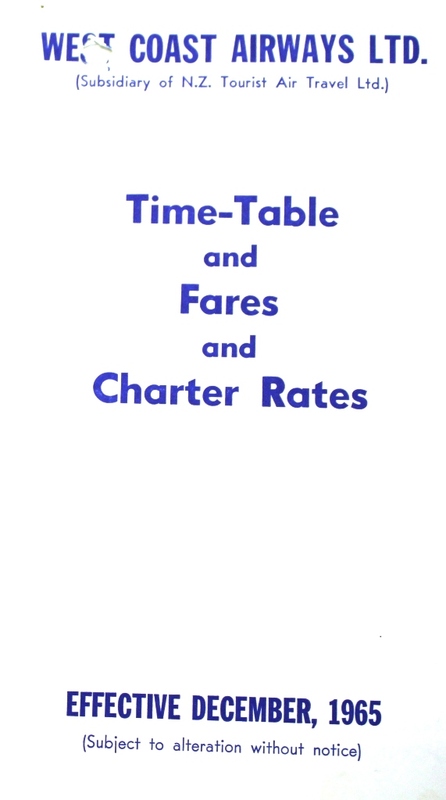 It is seen in Tourist Air Travel titles at Hokitika in the early 1970s. I remember as a child watching the Dragon Rapide/Dominies fly south from Hokitika. Sadly I was too young to capture any of this airline on film! 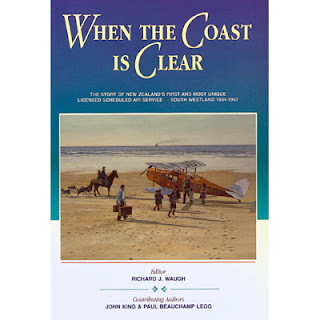 Richard Waugh’s books, When the Coast is Clear and Hoki to Haast provide a lot more details on this company.